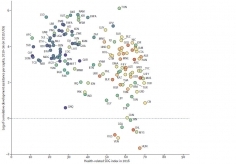 Published in The Lancet on September 12, 2017, the study, “Measuring progress and projecting attainment on the basis of past trends of the health-related Sustainable Development Goals in 188 countries: an analysis from the Global Burden of Disease Study 2016,” is the second annual report on health-related SDG indicators by the Institute for Health Metrics and Evaluation (IHME) and Global Burden of Disease collaborators. The publication of the scientific paper coincides with the release of a new report at the United Nations General Assembly (UNGA) by the Bill & Melinda Gates Foundation. Goalkeepers: The Stories Behind the Data is the foundation’s first annual progress report on the SDGs and was produced in partnership with IHME. This report will be presented at a separate event during the UNGA at 9 am ET on Wednesday, September 20. The event will bring together speakers from around the world – including former US President Barack Obama, Malala Yousafzai, Bill Gates, and Melinda Gates – and focus on ways we can drive more progress in health and development. 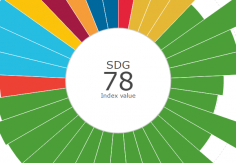 In addition, IHME updated its Sustainable Development Goals visualization tool, which allows users to compare and contrast between countries and among indicators. Building on results from last year’s reports, these updated findings are important to understanding today’s gains and gaps for the health-related SDGs, and are essential for decision-makers as they aim to improve the health of populations. Below we have highlighted some uses and coverage of last year’s SDG report and paired them with particularly interesting or notable findings from GBD 2016, which include projections to 2030 based on past trends and projected attainment of SDG targets. In addition to updating results for 1990 to 2016, the GBD 2016 SDG collaborators produced projections for each health-related SDG indicator through 2030; they accomplished this by using past trends (1990 to 2016) to inform these projections. Based on past rates of progress, Timor-Leste was projected to have among the most pronounced improvements on the health-related SDGs by 2030. The GBD 2016 SDG analysis also re-emphasized Timor-Leste’s substantial gains on the universal health coverage (UHC) index between 2000 and 2016. As highlighted in a Nature commentary, the GBD 2015 baseline assessment of the health-related Sustainable Development Goals was recognized as the only effort “specifically designed to track a part of the SDG agenda.” Furthermore, the Sustainable Development Solutions Network (SDSN) used the GBD 2015 universal health coverage tracer measure as part of their 2017 SDG index update. SDSN aims to quantify the full range of SDG targets and indicators, while the GBD collaboration focuses on measuring the health-related SDGs. For the GBD 2016 SDG analysis, researchers substantially improved the assessment of UHC by incorporating measures of health care for non-communicable diseases. To do this, they used the Healthcare Access and Quality (HAQ) index, a summary measure of national levels of personal health care access and quality that originated from the GBD 2015 study. As emphasized by the World Health Organization’s Director-General and former IHME board member Dr. Tedros Ghebreyesus, achieving UHC is viewed as a cornerstone to attaining the health-related SDGs. This updated measure of UHC can provide the basis for monitoring national progress in expanding essential health services to all populations. As highlighted in the media and scientific literature, India’s baseline performance on the health-related SDGs showed much room for improvement in the post-2015 era. Based on the GBD 2015 assessment of the health-related SDGs, areas of particular priority included environmental risks (e.g., exposure to unsafe water and ambient air pollution), maternal mortality, and malaria. GBD 2016 results show that, based on past rates of progress, India is projected to meet the SDG target for under-5 mortality by 2030 (25 deaths per 1,000 live births or lower). Yet in the absence of accelerated progress between 2017 and 2030, several health challenges may persist in India, particularly those associated with child growth failure, ambient air pollution, and a subset of infectious diseases (e.g., malaria, hepatitis B). Along with Sweden and Iceland, Singapore recorded the highest performance on the health-related Sustainable Development Goals in 2015. These findings were based on the GBD 2015 baseline assessment of the health-related SDGs. Singapore’s noteworthy performance was driven by scoring above 90 (out of 100) for 20 of the 33 health-related SDG indicators included in GBD 2015, ranging from skilled birth attendance to mortality due to interpersonal violence. For GBD 2016, Singapore recorded the highest overall performance on the health-related SDGs in 2016. However, based on trends observed from 1990 to 2016, projections to 2030 showed stalled progress for Singapore on many of the health-related SDGs. Child overweight emerged as one of the largest potential health challenges for Singapore in the SDG era, as well as for many others among the 188 countries included in the GBD 2016 SDG assessment. “How is your country doing?” was the World Economic Forum’s response to the GBD 2015 baseline assessment of the health-related SDGs. In their article, the World Economic Forum highlighted countries with the highest performance in 2015 (Iceland, Sweden, and Singapore), but also stressed the challenges ahead – for all countries – for building effective, sustainable health systems. Singapore, Iceland, and Sweden again recorded the best performances on the health-related SDG index in 2016, according to GBD 2016 SDG collaborators. Nonetheless, according to projections to 2030, which were informed by past trends, Norway and Finland edged out Iceland and Sweden for the second and third spots on the health-related SGD index in 2030. These findings were at least in part due to projected stagnation on improvements in some health areas, including child overweight and alcohol use. From 2000 to 2015, Vietnam recorded substantial improvements on many health areas now represented in the Sustainable Development Goals (SDGs), a finding that may position Vietnam for further gains over the next 15 years. These results draw from the health-related SDG index, a summary measure of 37 health-related SDG indicators assessed by GBD 2015. 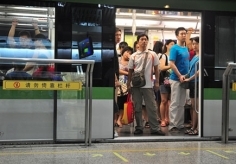 “Behind these increasing numbers is an important human reality: higher scores mean healthier people,” said Dr. Justin Beardsley of the Oxford University Clinical Research Unit in Ho Chi Minh City. Results of the GBD 2016 SDG analysis show that, based on past trends, Vietnam could see continued gains in performance for several indicators, including child stunting and sanitation. Of the 24 measured indicators with defined SDG targets, Vietnam was projected to meet three – maternal mortality ratio, under-5 mortality, and neonatal mortality – in 2030 on the basis of past trends. The need to accelerate progress in health in Pakistan was emphasized after the country ranked 149th out of 188 countries for the health-related Sustainable Development Goal (SDG) index in 2015, according to the GBD 2015 baseline assessment of the health=related SDGs. Conflict mortality, unsafe water and hygiene, and neonatal mortality were among the SDG indicators on which Pakistan performed the worst in 2015. Conversely, in comparison with other countries, Pakistan scored fairly well on prevalence of neglected tropical diseases, harmful alcohol use, and child overweight. “These analyses are critically important for Pakistan, where limited data make the transition from MDGs to the SDGs even more challenging. These data allow the country to set a baseline based on recent performance and also set a trajectory for achieving the health and health-related SDGs,” said Professor Zulfiqar Bhutta, a GBD collaborator and Founding Director of the Aga Khan University’s Centre of Excellence in Women and Child Health. On the basis of past rates of progress, Pakistan was projected to see the largest gains in performance for skilled birth attendance, child stunting, sanitation, and household air pollution by 2030. Nonetheless, in the absence of accelerated gains, 2030 projections had Pakistan achieving none of the 24 currently measured SDG indicators with defined targets. Australia’s performance on the health-related Sustainable Development Goals was heralded by the Brisbane Times, with the country scoring 81 out of 100 on the health-related SDG index for 2015. These results came from the GBD 2015 baseline assessment of the health-related SDGs. 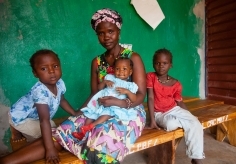 Australia recorded among the best performances on several SDG indicators in 2015, including conflict mortality, child stunting and wasting, and maternal mortality. The GBD 2016 update for the health-related SDGs showed similar levels of high performance in Australia one year later; however, projections based on past rates of progress showed few improvements for the country by 2030. Such stagnation in projected performance was mainly driven by child overweight, as well as relatively minimal gains on other SDG indicators. GBD 2016 results show that, based on past rates of progress, Ghana is projected to see substantial advances in its 2030 performance on skilled birth attendance, sanitation, met need for family planning with modern contraception methods, and household air pollution. Based on past trends, Ghana is projected to meet one – vaccine coverage – of the 24 currently measured health-related SDG indicators with defined targets in 2030. The Global Burden of Disease Study 2015 is a key contributor to the “new vital science” of measuring progress towards the Sustainable Development Goals, according to a special report published in The Lancet. Due to the SDGs’ broadened development agenda – 17 goals, 169 targets, and 232 indicators – many concerns have emerged regarding how, or if, tracking improvements and challenges on the SDGs would be possible. With the GBD 2015 baseline assessment of the health-related SDGs, the GBD collaboration provided a scientifically strong, independent platform for measuring gains on the health-related SDGs.